Writing Charlie Hanson was an interesting challenge. Unlike Charlie, math doesn’t make my heart go pitter-patter. Math makes my heart drop into my stomach. It scares me more than clowns. Well, almost more than clowns. But Charlie showed up in my mind fully formed, and no matter how I tried to convince him that he should be a poet or a musician, he’d shake his head and point to a page in this ragged, spiral bound notebook full of monster math problems. It became clear, that while I could write the story in a way that would help Charlie begin to see the beauty of literature, I’d only accomplish that if I started seeing the beauty in math. We’d have to compromise, Charlie and me, if we were going to tell this story, properly. What I discovered is that despite our differences, Charlie and me do have a few things in common. To make Charlie proud, I put together this Venn diagram to illustrate. I’d love to see how you compare to your favorite character. Make a chart and share it here on the blog, Twitter, or Instagram. You can be as creative with the charts as you want. I can’t wait to see what you come up with! Be sure to tag us on Twitter @shanlalexander or on Instagram @wanderthewords so we can see them! 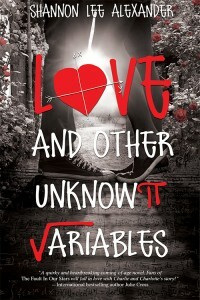 Don’t miss the final teaser for Love and Other Unknown Variables HERE! One of my favorite literary characters (Can anyone really choose just one?) is Hermione Granger. A few things we have in common are our love of books and cats. Though, this could probably apply to just about everyone. Because let’s face it. Who doesn’t like books and cats? I wanted to be Hermoine so badly. She is smart, confident, and loyal to her friends. To top it off, she gets Ron Weasley in the end. I love Ron. My daughter is actually the spitting image of Hermoine, right down to the unruly curls and addiction to books. I’m one proud mom! 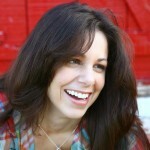 i have blogging and a weakness for green eyes in common with my fave heroine! 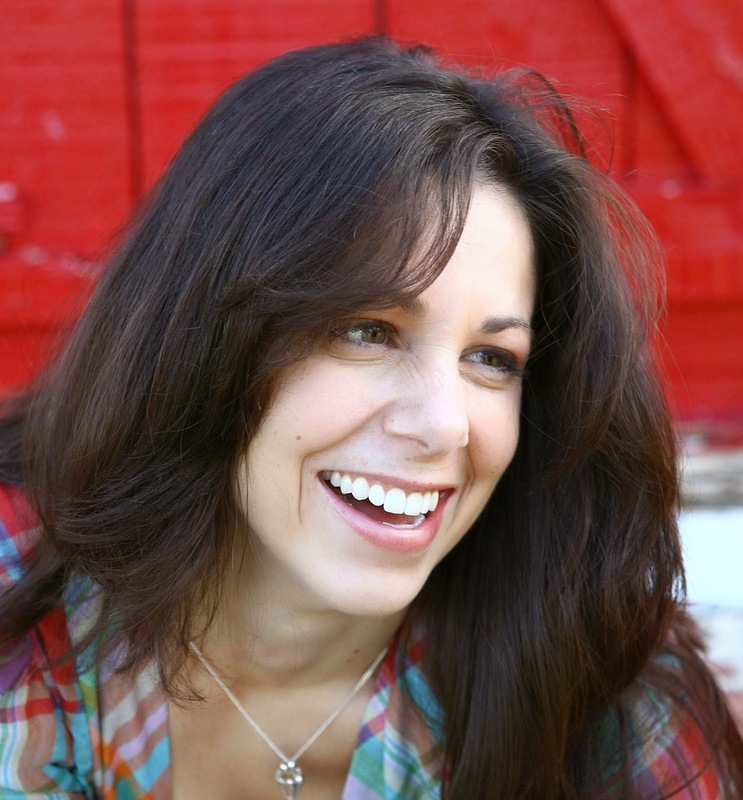 Green eyes are so popular in fiction, but I’ve only met a handful of people with them in real life. Guess that’s why we love them so much! One of my favorite literary characters of ever is Cath from Rainbow Rowell’s Fangirl. We’re both nerdy, book-obsessed, and pretty introverted compared to our siblings. I’ve joked before that Cath is my spirit animal! I’m very similar to her also. I even have a sister who was very much like Wren when we were in college. Thankfully, things got better for my sister and me. This is Cath’s line that completely describes me, “Underneath this veneer of slightly crazy and socially inept, I’m a complete disaster.” That’s me. 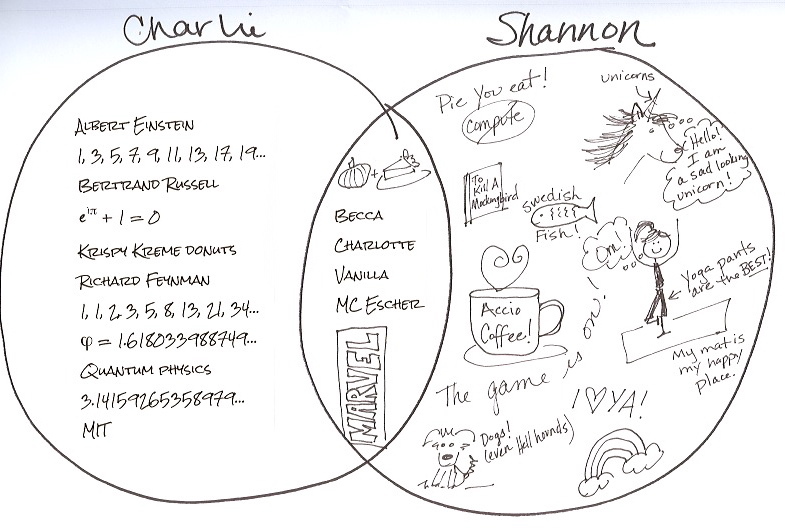 This diagram really illustrates their personalities… One prefers writing and the other one drawing… CUTE!! !